Illuminance is light falling on a surface measured in footcandles or lux. Distributed with an economic and visual plan, it becomes engineered lighting and, therefore, practical illumination. 2. Furnish high quality lighting by providing a uniform illuminance level, where required, and by minimizing the negative effects of direct and reflected glare. The most common measure of light output (or luminous flux) is the lumen. Light sources are labeled with an output rating in lumens. For example, a T12 40-watt fluorescent lamp may have a rating of 3050 lumens. Similarly, a light fixture’s output can be expressed in lumens. As lamps and fixtures age and become dirty, their lumen output decreases (i.e., lumen depreciation occurs). Most lamp ratings are based on initial lumens (i.e., when the lamp is new). Another measurement of light is luminance, sometimes called brightness. This measures light “leaving” a surface in a particular direction, and considers the illuminance on the surface and the reflectance of the surface. The human eye does not see illuminance; it sees luminance. Therefore, the amount of light delivered into the space and the reflectance of the surfaces in the space affects your ability to see. Luminous flux is commonly called light output and is measured in lumens (lm). Illuminance is called light level and is measured in footcandles (fc). 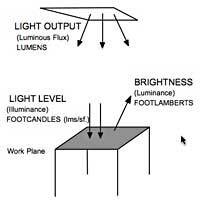 Luminance is referred to as brightness and is measured in footlamberts (fL) or candelas/m2 (cd/m2). When designing a new or upgraded lighting system, one must be careful to avoid overlighting a space. In the past, spaces were designed for as much as 200 footcandles in places where 50 footcandles may not only be adequate, but superior. This was partly due to the misconception that the more light in a space, the higher the quality. Not only does overlighting waste energy, but it can also reduce lighting quality. Refer to Exhibit 2 for light levels recommended by the Illuminating Engineering Society of North America. Within a listed range of illuminance, three factors dictate the proper level: age of the occupant(s), speed and accuracy requirements, and background contrast. 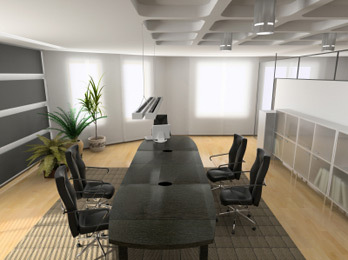 For example, to light a space that uses computers, the overhead light fixtures should provide up to 30 fc of ambient lighting. The task lights should provide the additional footcandles needed to achieve a total illuminance of up to 50 fc for reading and writing. For illuminance recommendations for specific visual tasks, refer to the IES Lighting Handbook, 1993, or to the IES Recommended Practice No. 24 (for VDT lighting). Visual comfort probability (VCP) indicates the percent of people who are comfortable with the glare from a fixture. Spacing criteria (SC) refers to the maximum recommended distance between fixtures to ensure uniformity. Color rendering index (CRI) indicates the color appearance of an object under a source as compared to a reference source. Improvements in lighting quality can yield high dividends for US businesses. Gains in worker productivity may result by providing corrected light levels with reduced glare. Although the cost of energy for lighting is substantial, it is small compared with the cost of labor. Therefore, these gains in productivity may be even more valuable than the energy savings associated with new lighting technologies. In retail spaces, attractive and comfortable lighting designs can attract clientele and enhance sales. Three quality issues are addressed in this section. Perhaps the most important factor with respect to lighting quality is glare. Glare is a sensation caused by luminances in the visual field that are too bright. Discomfort, annoyance, or reduced productivity can result. A bright object alone does not necessarily cause glare, but a bright object in front of a dark background, however, usually will cause glare. Contrast is the relationship between the luminance of an object and its background. Although the visual task generally becomes easier with increased contrast, too much contrast causes glare and makes the visual task much more difficult. You can reduce glare or luminance ratios by not exceeding suggested light levels and by using lighting equipment designed to reduce glare. A louver or lens is commonly used to block direct viewing of a light source. Indirect lighting, or uplighting, can create a low glare environment by uniformly lighting the ceiling. Also, proper fixture placement can reduce reflected glare on work surfaces or computer screens. Standard data now provided with luminaire specifications include tables of its visual comfort probability (VCP) ratings for various room geometries. The VCP index provides an indication of the percentage of people in a given space that would find the glare from a fixture to be acceptable. A minimum VCP of 70 is recommended for commercial interiors, while luminaires with VCPs exceeding 80 are recommended in computer areas. The uniformity of illuminance is a quality issue that addresses how evenly light spreads over a task area. Although a room’s average illuminance may be appropriate, two factors may compromise uniformity. The ability to see colors properly is another aspect of lighting quality. Light sources vary in their ability to accurately reflect the true colors of people and objects. The color rendering index (CRI) scale is used to compare the effect of a light source on the color appearance of its surroundings. A scale of 0 to 100 defines the CRI. A higher CRI means better color rendering, or less color shift. CRIs in the range of 75-100 are considered excellent, while 65-75 are good. The range of 55-65 is fair, and 0-55 is poor. Under higher CRI sources, surface colors appear brighter, improving the aesthetics of the space. Sometimes, higher CRI sources create the illusion of higher illuminance levels. Commercial, industrial, and retail facilities use several different light sources. Each lamp type has particular advantages; selecting the appropriate source depends on installation requirements, life-cycle cost, color qualities, dimming capability, and the effect wanted. Before describing each of these lamp types, the following sections describe characteristics that are common to all of them. Another characteristic of a light source is the color temperature. This is a measurement of “warmth” or “coolness” provided by the lamp. People usually prefer a warmer source in lower illuminance areas, such as dining areas and living rooms, and a cooler source in higher illuminance areas, such as grocery stores. Color temperature refers to the color of a blackbody radiator at a given absolute temperature, expressed in Kelvins. A blackbody radiator changes color as its temperature increases ( first to red, then to orange, yellow, and finally bluish white at the highest temperature. A “warm” color light source actually has a lower color temperature. For example, a cool-white fluorescent lamp appears bluish in color with a color temperature of around 4100 K. A warmer fluorescent lamp appears more yellowish with a color temperature around 3000 K. Refer to Exhibit 5 for color temperatures of various light sources. The CRI is a relative scale (ranging from 0 – 100). indicating how perceived colors match actual colors. It measures the degree that perceived colors of objects, illuminated by a given light source, conform to the colors of those same objects when they are lighted by a reference standard light source. The higher the color rendering index, the less color shift or distortion occurs. Incandescent lamps are one of the oldest electric lighting technologies available. With efficacies ranging from 6 to 24 lumens per watt, incandescent lamps are the least energy-efficient electric light source and have a relatively short life (750-2500 hours). Light is produced by passing a current through a tungsten filament, causing it to become hot and glow. With use, the tungsten slowly evaporates, eventually causing the filament to break. These lamps are available in many shapes and finishes. The two most common types of shapes are the common “A-type” lamp and the reflector-shaped lamps. The tungsten halogen lamp is another type of incandescent lamp. In a halogen lamp, a small quartz capsule contains the filament and a halogen gas. The small capsule size allows the filament to operate at a higher temperature, which produces light at a higher efficacy than standard incandescents. The halogen gas combines with the evaporated tungsten, redepositing it on the filament. This process extends the life of the filament and keeps the bulb wall from blackening and reducing light output. Because the filament is relatively small, this source is often used where a highly focused beam is desired. Compact halogen lamps are popular in retail applications for display and accent lighting. In addition, tungsten-halogen lamps generally produce a whiter light than other incandescent lamps, are more efficient, last longer, and have improved lamp lumen depreciation. More efficient halogen lamps are available. These sources use an infrared coating on the quartz bulb or an advanced reflector design to redirect infrared light back to the filament. The filament then glows hotter and the efficiency of the source is increased. Fluorescent lamps are the most commonly used commercial light source in North America. In fact, fluorescent lamps illuminate 71% of the commercial space in the United States. Their popularity can be attributed to their relatively high efficacy, diffuse light distribution characteristics, and long operating life. An electric discharge (current) is maintained between the electrodes through the mercury vapor and inert gas. This current excites the mercury atoms, causing them to emit non-visible ultraviolet (UV) radiation. This UV radiation is converted into visible light by the phosphors lining the tube. Discharge lamps (such as fluorescent) require a ballast to provide correct starting voltage and to regulate the operating current after the lamp has started. Full-size fluorescent lamps are available in several shapes, including straight, U-shaped, and circular configurations. Lamp diameters range from 1″ to 2.5″. The most common lamp type is the four-foot (F40), 1.5″ diameter (T12) straight fluorescent lamp. More efficient fluorescent lamps are now available in smaller diameters, including the T10 (1.25 “) and T8 (1″). Fluorescent lamps are available in color temperatures ranging from warm (2700(K) “incandescent-like” colors to very cool (6500(K) “daylight” colors. “Cool white” (4100(K) is the most common fluorescent lamp color. Neutral white (3500(K) is becoming popular for office and retail use. Improvements in the phosphor coating of fluorescent lamps have improved color rendering and made some fluorescent lamps acceptable in many applications previously dominated by incandescent lamps. The performance of any luminaire system depends on how well its components work together. With fluorescent lamp-ballast systems, light output, input watts, and efficacy are sensitive to changes in the ambient temperature. When the ambient temperature around the lamp is significantly above or below 25C (77F), the performance of the system can change. Exhibit 6 shows this relationship for two common lamp-ballast systems: the F40T12 lamp with a magnetic ballast and the F32T8 lamp with an electronic ballast. As you can see, the optimum operating temperature for the F32T8 lamp-ballast system is higher than for the F40T12 system. Thus, when the ambient temperature is greater than 25C (77F), the performance of the F32T8 system may be higher than the performance under ANSI conditions. Lamps with smaller diameters (such as T-5 twin tube lamps) peak at even higher ambient temperatures. Advances in phosphor coatings and reductions of tube diameters have facilitated the development of compact fluorescent lamps. Manufactured since the early 1980s, they are a long-lasting, energy-efficient substitute for the incandescent lamp. Various wattages, color temperatures, and sizes are available. The wattages of the compact fluorescents range from 5 to 40 ( replacing incandescent lamps ranging from 25 to 150 watts ( and provide energy savings of 60 to 75 percent. While producing light similar in color to incandescent sources, the life expectancy of a compact fluorescent is about 10 times that of a standard incandescent lamp. Note, however, that the use of compact fluorescent lamps is very limited in dimming applications. Integral Units. These consist of a compact fluorescent lamp and ballast in self-contained units. Some integral units also include a reflector and/or glass enclosure. Modular Units. The modular type of retrofit compact fluorescent lamp is similar to the integral units, except that the lamp is replaceable. A Specifier Report that compares the performance of various name-brand compact fluorescent lamps is now available from the National Lighting Product Information Program (“Screw-Base Compact Fluorescent Lamp Products,” Specifier Reports, Volume 1, Issue 6, April 1993). High-intensity discharge (HID) lamps are similar to fluorescents in that an arc is generated between two electrodes. The arc in a HID source is shorter, yet it generates much more light, heat, and pressure within the arc tube. Originally developed for outdoor and industrial applications, HID lamps are also used in office, retail, and other indoor applications. Their color rendering characteristics have been improved and lower wattages have recently become available ( as low as 18 watts. However, the following operating limitations must also be considered. First, HID lamps require time to warm up. It varies from lamp to lamp, but the average warm-up time is 2 to 6 minutes. Second, HID lamps have a “restrike” time, meaning a momentary interruption of current or a voltage drop too low to maintain the arc will extinguish the lamp. At that point, the gases inside the lamp are too hot to ionize, and time is needed for the gases to cool and pressure to drop before the arc will restrike. This process of restriking takes between 5 and 15 minutes, depending on which HID source is being used. Therefore, good applications of HID lamps are areas where lamps are not switched on and off intermittently. Clear mercury vapor lamps, which produce a blue-green light, consist of a mercury-vapor arc tube with tungsten electrodes at both ends. These lamps have the lowest efficacies of the HID family, rapid lumen depreciation, and a low color rendering index. Because of these characteristics, other HID sources have replaced mercury vapor lamps in many applications. However, mercury vapor lamps are still popular sources for landscape illumination because of their 24,000 hour lamp life and vivid portrayal of green landscapes. 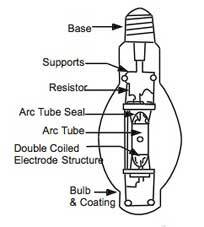 The arc is contained in an inner bulb called the arc tube. The arc tube is filled with high purity mercury and argon gas. The arc tube is enclosed within the outer bulb, which is filled with nitrogen. Color-improved mercury lamps use a phosphor coating on the inner wall of the bulb to improve the color rendering index, resulting in slight reductions in efficiency. These lamps are similar to mercury vapor lamps but use metal halide additives inside the arc tube along with the mercury and argon. These additives enable the lamp to produce more visible light per watt with improved color rendition. Wattages range from 32 to 2,000, offering a wide range of indoor and outdoor applications. The efficacy of metal halide lamps ranges from 50 to 115 lumens per watt ( typically about double that of mercury vapor. In short, metal halide lamps have several advantages. The rated life of metal halide lamps is shorter than other HID sources; lower-wattage lamps last less than 7500 hours while high-wattage lamps last an average of 15,000 to 20,000 hours. Because of the good color rendition and high lumen output, these lamps are good for sports arenas and stadiums. Indoor uses include large auditoriums and convention halls. These lamps are sometimes used for general outdoor lighting, such as parking facilities, but a high pressure sodium system is typically a better choice. The high pressure sodium (HPS) lamp is widely used for outdoor and industrial applications. Its higher efficacy makes it a better choice than metal halide for these applications, especially when good color rendering is not a priority. HPS lamps differ from mercury and metal-halide lamps in that they do not contain starting electrodes; the ballast circuit includes a high-voltage electronic starter. The arc tube is made of a ceramic material which can withstand temperatures up to 2372F. It is filled with xenon to help start the arc, as well as a sodium-mercury gas mixture. The efficacy of the lamp is very high ( as much as 140 lumens per watt. For example, a 400-watt high pressure sodium lamp produces 50,000 initial lumens. The same wattage metal halide lamp produces 40,000 initial lumens, and the 400-watt mercury vapor lamp produces only 21,000 initially. Sodium, the major element used, produces the “golden” color that is characteristic of HPS lamps. Although HPS lamps are not generally recommended for applications where color rendering is critical, HPS color rendering properties are being improved. Some HPS lamps are now available in “deluxe” and “white” colors that provide higher color temperature and improved color rendition. The efficacy of low-wattage “white” HPS lamps is lower than that of metal halide lamps (lumens per watt of low-wattage metal halide is 75-85, while white HPS is 50-60 LPW). Although low pressure sodium (LPS) lamps are similar to fluorescent systems (because they are low pressure systems), they are commonly included in the HID family. LPS lamps are the most efficacious light sources, but they produce the poorest quality light of all the lamp types. Being a monochromatic light source, all colors appear black, white, or shades of gray under an LPS source. LPS lamps are available in wattages ranging from 18-180. LPS lamp use has been generally limited to outdoor applications such as security or street lighting and indoor, low-wattage applications where color quality is not important (e.g. stairwells). However, because the color rendition is so poor, many municipalities do not allow them for roadway lighting. Because the LPS lamps are “extended” (like fluorescent), they are less effective in directing and controlling a light beam, compared with “point sources” like high-pressure sodium and metal halide. Therefore, lower mounting heights will provide better results with LPS lamps. To compare a LPS installation with other alternatives, calculate the installation efficacy as the average maintained footcandles divided by the input watts per square foot of illuminated area. The input wattage of an LPS system increases over time to maintain consistent light output over the lamp life. The low-pressure sodium lamp can explode if the sodium comes in contact with water. Dispose of these lamps according to the manufacturer’s instructions. Because ballasts are an integral component of the lighting system, they have a direct impact on light output. The ballast factor is the ratio of a lamp’s light output using a standard reference ballast, compared to the lamp’s rated light output on a laboratory standard ballast. General purpose ballasts have a ballast factor that is less than one; special ballasts may have a ballast factor greater than one. Standard core-coil magnetic ballasts are essentially core-coil transformers that are relatively inefficient in operating fluorescent lamps. The high-efficiency ballast replaces the aluminum wiring and lower grade steel of the standard ballast with copper wiring and enhanced ferromagnetic materials. The result of these material upgrades is a 10 percent system efficiency improvement. However, note that these “high efficiency” ballasts are the least efficient magnetic ballasts that are available for operating full-size fluorescent lamps. More efficient ballasts are described below. “Cathode cut-out” (or “hybrid“) ballasts are high-efficiency core-coil ballasts that incorporate electronic components that cut off power to the lamp cathodes (filaments) after the lamps are lit, resulting in an additional 2-watt savings per standard lamp. Also, many partial-output T12 hybrid ballasts provide up to 10% less light output while consuming up to 17% less energy than energy-efficient magnetic ballasts. Full-output T8 hybrid ballasts are nearly as efficient as rapid-start two-lamp T8 electronic ballasts. In nearly every full-size fluorescent lighting application, electronic ballasts can be used in place of conventional magnetic “core-and-coil” ballasts. Electronic ballasts improve fluorescent system efficacy by converting the standard 60 Hz input frequency to a higher frequency, usually 25,000 to 40,000 Hz. Lamps operating at these higher frequencies produce about the same amount of light, while consuming 12 to 25 percent less power. Other advantages of electronic ballasts include less audible noise, less weight, virtually no lamp flicker, and dimming capabilities (with specific ballast models). These ballasts are designed for use with conventional (T12 or T10) fluorescent lighting systems. Some electronic ballasts that are designed for use with 4′ lamps can operate up to four lamps at a time. Parallel wiring is another feature now available that allows all companion lamps in the ballast circuit to continue operating in the event of a lamp failure. Electronic ballasts are also available for 8′ standard and high-output T12 lamps. These ballasts permit the light output of the lamps to be dimmed based on input from manual dimmer controls or from devices that sense daylight or occupancy. The specific fluorescent circuit in use can be identified by the label on the ballast. The rapid start circuit is the most used system today. Rapid start ballasts provide continuous lamp filament heating during lamp operation (except when used with a cathode cut-out ballast or lamp). Users notice a very short delay after “flipping the switch,” before the lamp is started. The instant start system ignites the arc within the lamp instantly. This ballast provides a higher starting voltage, which eliminates the need for a separate starting circuit. This higher starting voltage causes more wear on the filaments, resulting in reduced lamp life compared with rapid starting. The preheat circuit was used when fluorescent lamps first became available. This technology is used very little today, except for low-wattage magnetic ballast applications such as compact fluorescents. A separate starting switch, called a starter, is used to aid in forming the arc. 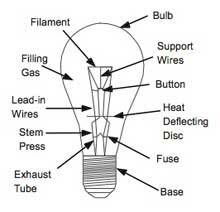 The filament needs some time to reach proper temperature, so the lamp does not strike for a few seconds. Like fluorescent lamps, HID lamps require a ballast to start and operate. The purposes of the ballast are similar: to provide starting voltage, to limit the current, and to match the line voltage to the arc voltage. With HID ballasts, a major performance consideration is lamp wattage regulation when the line voltage varies. With HPS lamps, the ballast must compensate for changes in the lamp voltage as well as for changes in the line voltages. Capacitive switching is available in new HID luminaires with special HID ballasts. The most common application for HID capacitive switching is in occupancy-sensed bi-level lighting control. Upon sensing motion, the occupancy sensor will send a signal to the bi-level HID system that will rapidly bring the light levels from a standby reduced level to approximately 80% of full output, followed by the normal warm-up time between 80% and 100% of full light output. Depending on the lamp type and wattage, the standby lumens are roughly 15-40% of full output and the input watts are 30-60% of full wattage. Therefore, during periods that the space is unoccupied and the system is dimmed, savings of 40-70% are achieved. Electronic ballasts for some types of HID lamps are starting to become commercially available. These ballasts offer the advantages of reduced size and weight, as well as better color control; however, electronic HID ballasts offer minimal efficiency gains over magnetic HID ballasts. The main function of the luminaire is to direct light using reflective and shielding materials. Many lighting upgrade projects consist of replacing one or more of these components to improve fixture efficiency. Alternatively, users may consider replacing the entire luminaire with one that I designed to efficiently provide the appropriate quantity and quality of illumination. The efficiency of a luminaire is the percentage of lamp lumens produced that actually exit the fixture. The use of louvers can improve visual comfort, but because they reduce the lumen output of the fixture, efficiency is reduced. Generally, the most efficient fixtures have the poorest visual comfort (e.g. bare strip industrial fixtures). Conversely, the fixture that provides the highest visual comfort level is the least efficient. Thus, a lighting designer must determine the best compromise between efficiency and VCP when specifying luminaires. Recently, some manufacturers have started offering fixtures with excellent VCP and efficiency. These so-called “super fixtures” combine state-of-the-art lens or louver designs to provide the best of both worlds. Surface deterioration and accumulated dirt in older, poorly maintained fixtures can also cause reductions in luminaire efficiency. Refer to Lighting Maintenance for more information. Each of the above luminaire types consist of a number of components that are designed to work together to produce and direct light. Because the subject of light production has been covered by the previous section, the text below focuses on the components used to direct the light produced by the lamps. Reflectors are designed to redirect the light emitted from a lamp in order to achieve a desired distribution of light intensity outside of the luminaire. In most incandescent spot and flood lights, highly specular (mirror-like) reflectors are usually built into the lamps. One energy-efficient upgrade option is to install a custom-designed reflector to enhance the light control and efficiency of the fixture, which may allow partial delamping. Retrofit reflectors are useful for upgrading the efficiency of older, deteriorated luminaire surfaces. A variety of reflector materials are available: highly reflective white paint, silver film laminate, and two grades of anodized aluminum sheet (standard or enhanced reflectivity). Silver film laminate is generally considered to have the highest reflectance, but is considered less durable. Proper design and installation of reflectors can have more effect on performance than the reflector materials. In combination with delamping, however, the use of reflectors may result in reduced light output and may redistribute the light, which may or may not be acceptable for a specific space or application. To ensure acceptable performance from reflectors, arrange for a trial installation and measure “before” and “after” light levels using the procedures outlined in Lighting Evaluations. For specific name-brand performance data, refer to Specifier Reports, “Specular Reflectors,” Volume 1, Issue 3, National Lighting Product Information Program. Most indoor commercial fluorescent fixtures use either a lens or a louver to prevent direct viewing of the lamps. Light that is emitted in the so-called “glare zone” (angles above 45 degrees from the fixture’s vertical axis) can cause visual discomfort and reflections, which reduce contrast on work surfaces or computer screens. Lenses and louvers attempt to control these problems. Lenses. Lenses made from clear ultraviolet-stabilized acrylic plastic deliver the most light output and uniformity of all shielding media. However, they provide less glare control than louvered fixtures. Clear lens types include prismatic, batwing, linear batwing, and polarized lenses. Lenses are usually much less expensive than louvers. White translucent diffusers are much less efficient than clear lenses, and they result in relatively low visual comfort probability. New low-glare lens materials are available for retrofit and provide high visual comfort (VCP>80) and high efficiency. Louvers. Louvers provide superior glare control and high visual comfort compared with lens-diffuser systems. The most common application of louvers is to eliminate the fixture glare reflected on computer screens. So-called “deep-cell” parabolic louvers ( with 5-7″ cell apertures and depths of 2-4″ ( provide a good balance between visual comfort and luminaire efficiency. Although small-cell parabolic louvers provide the highest level of visual comfort, they reduce luminaire efficiency to about 35-45 percent. For retrofit applications, both deep-cell and small-cell louvers are available for use with existing fixtures. Note that the deep-cell louver retrofit adds 2-4″ to the overall depth of a troffer; verify that sufficient plenum depth is available before specifying the deep-cell retrofit. Direct ( 90 to 100 percent of the light is directed downward for maximum use. Indirect ( 90 to 100 percent of the light is directed to the ceilings and upper walls and is reflected to all parts of a room. Semi-Direct ( 60 to 90 percent of the light is directed downward with the remainder directed upward. General Diffuse or Direct-Indirect ( equal portions of the light are directed upward and downward. Highlighting ( the beam projection distance and focusing ability characterize this luminaire. The lighting distribution that is characteristic of a given luminaire is described using the candela distribution provided by the luminaire manufacturer (see diagram on next page). The candela distribution is represented by a curve on a polar graph showing the relative luminous intensity 360 around the fixture ( looking at a cross-section of the fixture. This information is useful because it shows how much light is emitted in each direction and the relative proportions of downlighting and uplighting. The cut-off angle is the angle, measured from straight down, where the fixture begins to shield the light source and no direct light from the source is visible. The shielding angle is the angle, measured from horizontal, through which the fixture provides shielding to prevent direct viewing of the light source. The shielding and cut-off angles add up to 90 degrees.